Lately I have been enjoying some wonderful meals centered around Indian curry. Sometimes chicken, sometimes lamb or beef. Keema means ground meat. I used this great recipe my sister Margie gave me for a ground beef or lamb curry with lettuce. Yes, that sounds odd, and honestly it took me quite a while before I made it. Well, it was just delicious. I have made this favorite recipe many times over the years. Unfortunately, the recipe was lost a few years ago and I finally replicated it fairly well using some curry recipes and my memories of the ingredients and the flavors I wanted to achieve. I couldn’t find any recipe for a beef/lamb curry with lettuce so I started with one that used peas as a major flavor and used ground meat and modified it to re-create my keema curry. I love this made with lamb but I have used ground chuck in the past with a yummy curry resulting. Curry is not that hard to cook; saute, dump, stir, simmer…but it generally has a lot of spices. I use these spices a lot making different curries. I know it seems like a ton of ingredients but please don’t throw “curry powder” in this in lieu of the spices I named. That is just not going to work as curry powder has a single somewhat flat note to it. All these spices as well as the ginger and garlic work together to create a symphony of amazing and delightful flavors. You can cut back on the ginger and/or garlic to make it more mild or strong. If you want it mild leave out the red pepper flakes. I have successfully substituted tender shredded cabbage for the lettuce and I believe shredded romaine would also work. Possibly escarole would be successful too. I didn’t take any cooking pictures; was not thinking about my blog. Next time I make it I will try to get some shots and add them to this post. Ground meat curries are not that pretty looking but the flavor was all there. Instructions: Let meat rest until it has warmed to room temp. while you chop and measure. I put the whole spices in one small cup and the ground spices in a second small glass cup. Heat the oil in a large frying pan. Any oil you like will work other than EVOL. Add the dish of whole spices and let them heat until things crackle a bit. Add the onions and cook until they are soft and starting to caramelize a touch. Add the ground spices as well as the fresh ginger and garlic. Stir for a minute. Add the ground meat; I push it down so the spices and onions are pushed up around the meat; giving the meat the majority of the pan surface to brown on. Stir to brown the meat well. This may take 5-9 minutes. Add the tomatoes and cook for 5 minutes. Add the sliced lettuce and stir well. Add 1 cup water, cover and cook about 40 minutes. Can cook longer; up to 60 minutes if you like. Stir it every ten minutes and add more water if needed. It should not be dry. Stir in the yogurt, add salt and pepper to taste. Let stand five minutes before serving. Remove the cinnamon stick. I try to pick out the cardamon pods as biting into one of them can be a bit overwhelming. I serve mine over rice; brown rice is my preference for this curry. I made some sautéed green beans and asparagus spears with black mustard seeds and cumin seeds; a great combination I stumbled upon. Enjoy! My inspiration recipe was from my fancy pantry. They used peas not lettuce as the main veggie. I added and subtracted ingredients to re-create my beloved keema and lettuce curry. Been cold for several days: I think we all are craving warm comfort food. I made this several weeks ago for company and it was a big hit. We had it again last weekend for Joe’s birthday (he loves it for his special meal every year!) The potato crust is satisfying and the gravy chock full of meat and veggies is richly flavored. This is an Alton Brown recipe with a few minor changes. I added red wine, more veggies and I sometimes leave the egg out when I make the potato crust. The red wine makes the gravy taste perfect. Plus I used different meat and changed the flour to make it a gf choice. I know the list of ingredients might seem a bit daunting but it does go together fast. Just chop all the veggies first and brown the ground meat while your potatoes cook. We had homegrown potatoes for the crust for that company meal; oh so flavorful and homegrown peas and local corn in the filling. Yumm! The leftovers made a great lunch. Sure warms the tummy on a chilly day. I used a bit over a pound of meatloaf mix and some ground turkey meat. Another time it was ground chuck with a touch of meatloaf mix. The traditional meat is ground lamb; also tasty. You can use plain ground beef or even just ground turkey. All work fine. I also have a recipe for a vegetarian shepherd’s pie full of veggies with amazing gravy! Add the corn and peas to the meat and gravy mixture, stir for a few moments. If it seems very thick with really no gravy, add up to 1/2 cup water to thin it a bit (it will get thicker as it bakes) and spread evenly into an 11 by 7-inch glass baking dish. I have a lovely oval ceramic casserole Joe gave me that is perfect for shepherd’s pie. 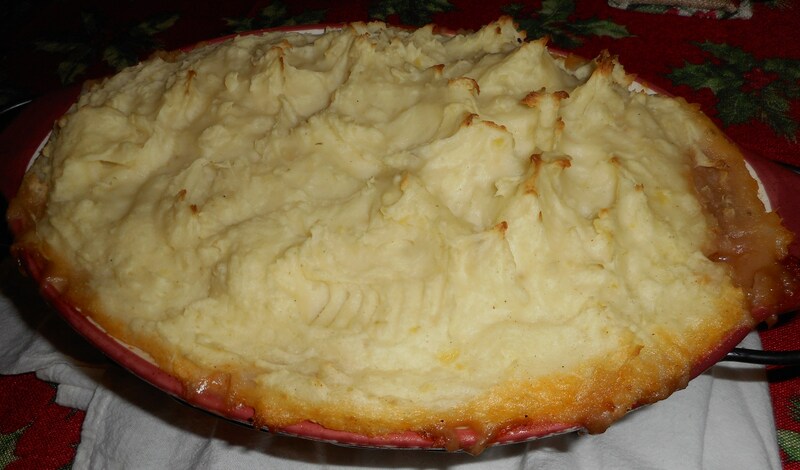 Top with the mashed potatoes, starting around the edges to create a seal to prevent the mixture from bubbling up and smooth with a rubber spatula. Place on a parchment lined half sheet pan on the middle rack of the oven and bake for 25 to 30 minutes or just until the potatoes begin to brown. Remove to a cooling rack for at least 15 minutes before serving. I searched long for a good recipe that had corn in it as that was what my guy wanted, I was dubious but this is such a tasty mixture I am a convert to corn in my shepherd’s pie! Okay, it is still winter and pretty cold but spring looms with daylight savings time beginning plus I am a tiny bit weary of posting soups. I do enjoy other sorts of food you know! There is this recipe I’ve been making for years. The other day I was chowing down my lunch and someone said, “What is that lovely roasty smell?” and I was able to say with a smile that it was my turkey meatballs with lemon gravy. 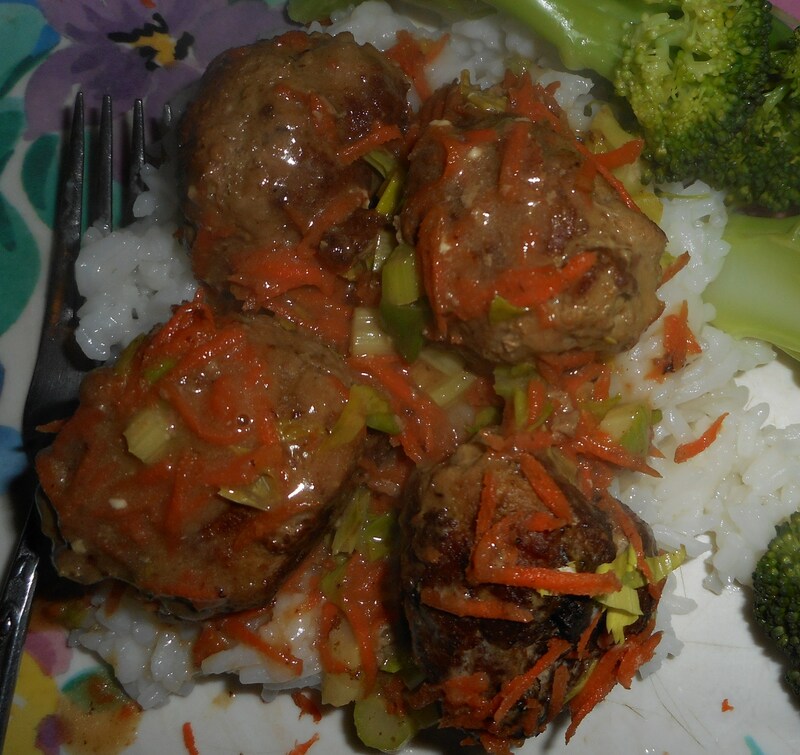 They are not fancy; the recipe, which I tore out of a woman’s magazine a decade ago, said they are supposed to replace regular meatballs as healthier but I just like them for their homey taste and the excellent sauce! 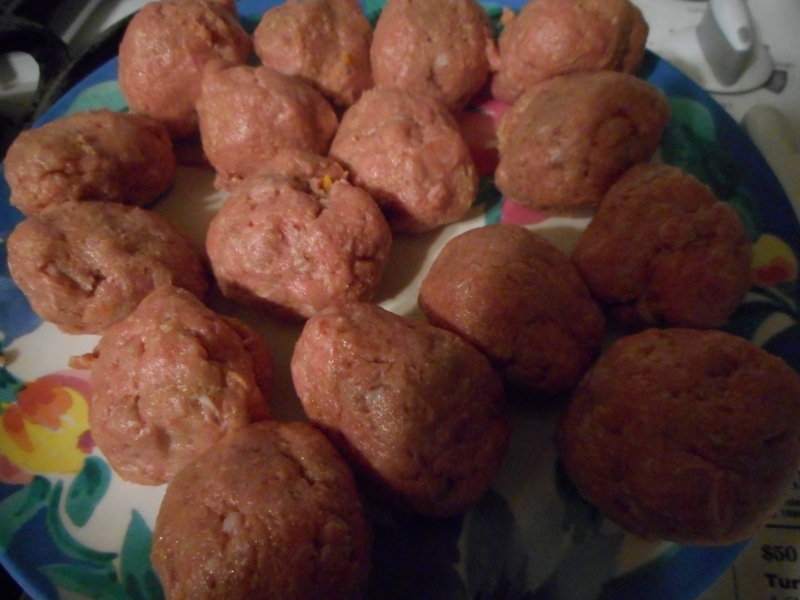 You can also make them with ground chicken; very good as well. I never seem to have enough sauce so you could make even more of that and be happy with the amount. I used to have them over noodles all the time but now that I am gf I occasionally use white or brown rice, both work very well with this sauce. I am guessing quinoa would be nice as well. It is the lemon that makes them taste so good but I also like the carrot and scallions in the sauce. Home flavors and pretty healthy, this is a satisfying meal with a starch and a veggie added on. And you can put it together in 30 minutes. Perfect for a week night supper. 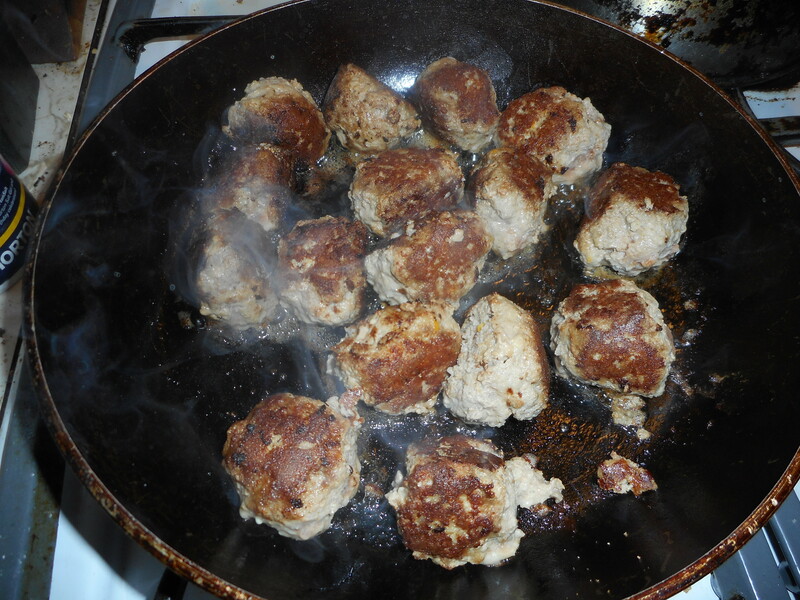 Mix the meatballs up in a large mixing bowl; dump in the ground turkey, add the onion, crumbs, Worcestershire sauce, lemon zest, sea salt, pepper to taste and egg. Mix until fairly well distributed. Form into 12-16 meatballs. Heat the oil in a wide Teflon or cast iron pan. 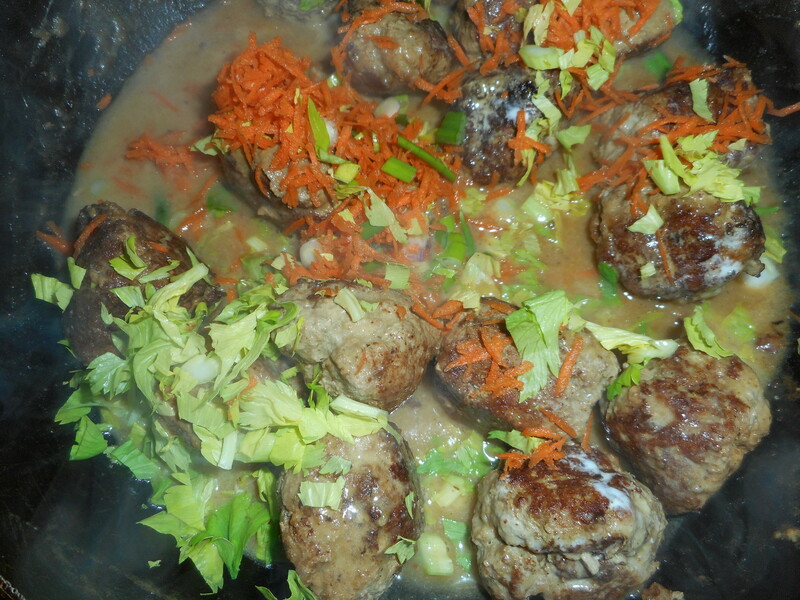 Add the meatballs. Brown them on all sides, turning carefully with a spatula and a fork. When browned add the broth and cover. Cook 12-15 minutes, add up to ½ cup more broth if needed; there should be at least ½ cup left when they are cooked. Add the flour to the yogurt, stir and add to the pan. 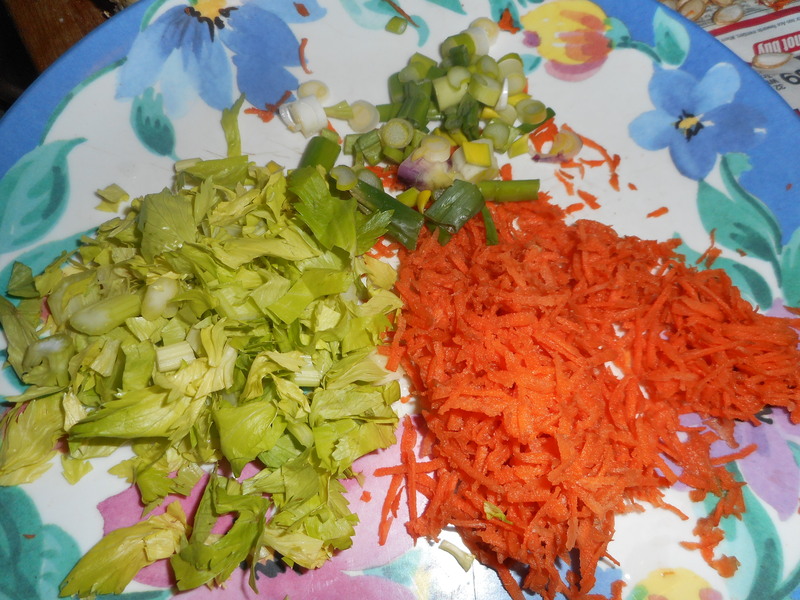 Add the lemon juice and stir in the carrot, celery if using it, and the white parts of the scallions. Cook 2-3 minutes. Add the rest of the scallions and stir. If it seems too thick add some more chicken broth. I like this new concentrate I found; by Kitchen Accomplice, makes 28 cups, it is a small squeeze bottle of liquid. Very handy and GF. Perfect when you need less than 15 ounces of broth. 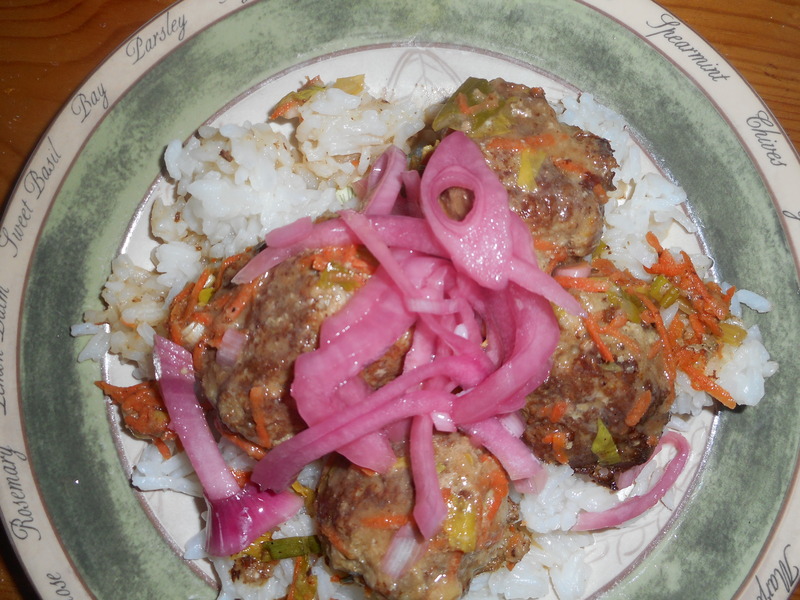 Serve the meatballs and sauce over rice or noodles. I have been experimenting lately and served a topping of pickled red onions; really nice zingy addition…up to you. For that I cut up part of a red onion and top with cider vinegar to cover, let stand at least 30 minutes. Will keep overnight in fridge. It is a fun topper on salads too. So cold right now, I think we all are craving warm comfort food. I made this last week for company and it was a big hit. The potato crust is satisfying and the gravy chock full of meat and veggies is richly flavored and addictive. This is an Alton brown recipe with a few minor changes. I added red wine, more veggies and I left the egg out when I made the potato crust. The red wine makes the gravy taste perfect. Plus I changed the flour to make it a gf choice. I know the list of ingredients might be daunting but it does go together fast. Just chop all the veggies first and brown the ground meat while your potatoes cook. We had home grown potatoes for the crust; oh so flavorful and homegrown peas and local corn in the filling. Yumm! The leftover made a great lunch the next day. Sure warms the tummy on a chilly chilly day. I used a bit over a pound of meatloaf mix and some ground turkey meat. You can use ground beef or even turkey. All work fine. I also have a recipe for a vegetarian shepherd’s pie full of veggies with amazing gravy! I meant to take more pictures while I made this but forgot; next time…. Peel the potatoes and cut into 1/2-inch dice. Place in a medium saucepan and cover with cold water. Set over high heat, cover and bring to a boil. Once boiling, uncover, decrease the heat to a simmer and cook until tender and easily pierced, approximately 10 to 15 minutes. Place the half-and-half and butter into a glass cup and heat in the microwave until warmed through, about 30 seconds. Drain the potatoes in a colander and then return to the saucepan. Mash the potatoes and then add the half and half, butter, salt and pepper and continue to mash until smooth. Stir in the yolk until combined. I did not add the yolk and it wasn’t missed. While the potatoes are cooking, prepare the filling. Place the canola oil into a 12-inch saute pan and set over medium high heat. Once the oil is hot, add the onion and carrots and saute just until they begin to soften, approximately 3 to 4 minutes. Add the garlic and stir to combine. Add the meat, salt and pepper and cook until browned and cooked through, approximately 3-4 minutes. Sprinkle the meat with the flour and stir, cook for another minute. Add the tomato paste, chicken broth, wine, Worcestershire, rosemary, thyme, and stir to combine. Bring to a boil, lower the heat, cover and simmer slowly 11 to 12 minutes or until the sauce is thickened slightly. Add the corn and peas to the meat mixture and spread evenly into an 11 by 7-inch glass baking dish. I used a lovely oval ceramic dish. Top with the mashed potatoes, starting along the edges and filling in, get it all the way to the edges to create a seal to prevent the mixture from bubbling up and smooth with a spatula. Place on a sheet pan on the middle rack of the oven and bake for 25-30 minutes or just until the potatoes begin to brown. Remove to a cooling rack for at least 15 minutes before serving.